So you are ready to purchase a new home. Congratulations. Whether you are a first time buyer or have been around the block a few times, there are several key facts you need to consider before signing on that dotted line. When you purchase a new home, you probably think hard about things like whether it has enough space for your entertaining needs or what the neighbors are like. However, there are also bigger issues that must be included in your decision making process. 1. The pros and cons of buying versus renting in your area. There are numerous benefits and headaches with each choice. Sometimes, based on the market and the economy, it’s better to wait. You also need to think about the return on investment and how much home you can afford. Also, if your potential mortgage would be more expensive than what you pay in rent, you may want to recalculate your finances and save for a while longer. The area where you live can also be a factor, as home prices might be vastly different from one area to the next. How long you plan to stay in the home could also contribute to your decision. 2. How the mortgage process works. Where will you get funding? How will the amount of your down payment affect your mortgage? Buying a home can feel like you are signing your life away, especially if you’ve never done it before. Many different terms are thrown at you and lots of people with various titles will come along and offer to help you. This is on top of all the legal and real estate issues you must contend with. Know your rights and get the best advice before embarking on this confusing process. 3. Learn as much as possible about the home and don’t be afraid to walk away. In the search for your dream home, you may find a house that you really love. When that happens, you might feel like you will do anything to get it. Even in a house that seems perfect on the surface, there could be issues lurking underneath. Basements, foundations and drainage issues must be thoroughly checked. If possible, get an inspection after it rains so you can really see what’s going on. Among other questions you may want to ask include how long the home has been on the market, typical cost of utilities and whether there is a homeowner’s association. You don’t want to purchase someone else’s headaches so if you find something that’s not right, walk away. 4. You might have to make some difficult choices. If you are selling your current home and buying another, one may happen faster than the other. This could mean finding temporary housing to make room for the new owner or settling on a home that is less than ideal. Also, there might be repairs that have to be made on your new home. For example, you could face issues with sewer lines or it may require an oil tank or pool removal. These might be items thatthe seller won’t pay for. Therefore, you would have to decide if it’s a project you want to take on as a DIY or to hire a professional contracting service. 5. Keep all money matters in mind at all times. The decision to buy a new home is exciting. However, don’t get so caught up in the thrill that you forget to get your finances in order. Down payments, credit scores and closing costs are all factors that will affect what you pay and how much you need to save. Experts recommend buying less house than you can afford to avoid becoming house poor. Also, it’s best to get pre-approved before you go house shopping. 6. Beware of money pits. You may remember the 1980s Tom Hanks/Shelley Long film called The Money Pit, where a couple purchases a huge home for a ridiculously low price and then discover why it was so cheap. Everything that can go wrong with a house does, in hilarious fashion. While the movie was funny, it’s no laughing matter when this happens to you in real life. Some of the items you should look out for include a roof that needs replacement, an old electrical system, cracks in the foundation and water stains on the ceiling. 7. Don’t rush your decision. Your home is likely the most expensive purchase you will ever make. It’s vital to take your time. Shop around for the best mortgage rates and homeowner’s insurance. Don’t let anyone pressure you into making an immediate decision. Some people believe that real estate agents are not worth the money and they can handle everything on their own. The truth is that agents understand the process better than you. Make sure you choose an agent accustomed to dealing with clients in your area and income bracket. A buyer’s agent will answer only to you so he will negotiate to get you the best deal. 9. Overlook the small stuff. Don’t let little things like paint colors in the bathroom or light fixtures in the kitchen sway your decision. It’s unlikely that the seller will match your exact tastes and choose the same cosmetic features that you would. Instead, look at things like the flow of the house, the size of the rooms and that it has enough outdoor space to fit your lifestyle. Everything about your new home will not always be picture-perfect. Whether it’s something that goes wrong or remodeling projects to make it better fit your current lifestyle, eventually, all homes require some amount of work. This is easier when you have the right contractors already lined up. Look for companies with extensive experience and the proper certifications and licenses. 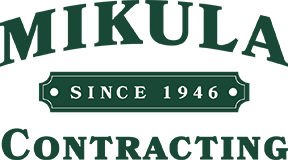 For demolition, disposal, drainage, excavation and trucking and material delivery, you can trust Mikula Contracting. We handle ground, land and backyard drainage as well as rainwater and standing water drainage and surface drainage systems. We service Essex, Passaic, Hudson, Bergen, Union and Morris counties. Call today for a fast quote.